For homebuyers, Lexington Homes offers Lexington Square 4 and under-construction Lexington Shore with yards and rooftop decks. Renters seeking outdoor space can lease at Ravenswood Terrace or Madison Aberdeen in the bustling West Loop. Summertime Chi, as native rapper Kanye West coined, is no joke for full-time residents of the Windy City. After a grueling winter (and sometimes spring), the ongoing hunt for rooftops and balconies to enjoy the warm months is real. Despite the trend, you don’t have to pay a $100 cover at a swanky River North bar to get a taste of the summer sunshine and warm, breezy nights. The following three renter and homeowner developments allow open-air delight from the comfort of home. Seeking more space in the heart of Chi-town? Look no further than the rowhomes at Lexington Square 4 on Morgan Street, just west of U.S. Cellular Field. Each unit offers multiple open-air oases, including a rooftop deck, kitchen-area balcony and fenced-in front yard. 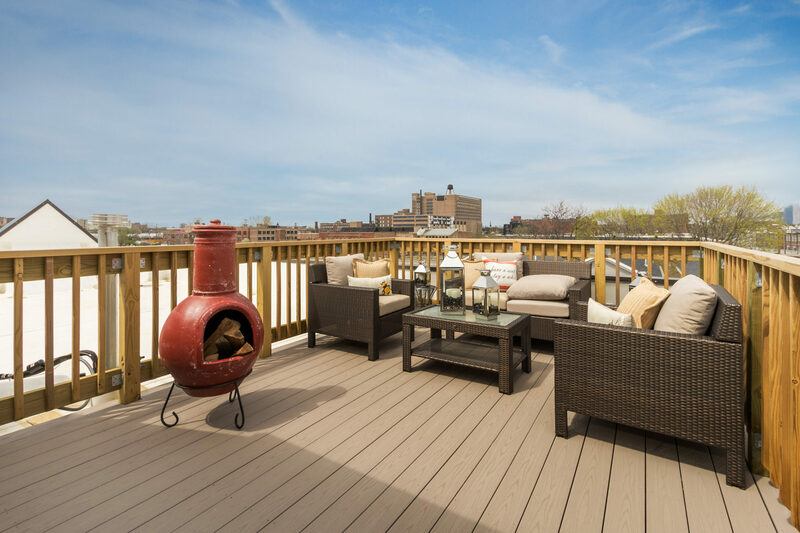 These homes offer expansive views of the glimmering skyline and even fireworks shows at U.S. Cellular Field on White Sox game nights. Lexington Square 4 is the fourth installment of Lexington Homes’ Bridgeport rowhome developments, following almost sold-out status for the first three properties. In total, the property offers 21 rowhomes ranging from 2,216 to 2,507 square feet. All homes start around $380,000 for the base package. 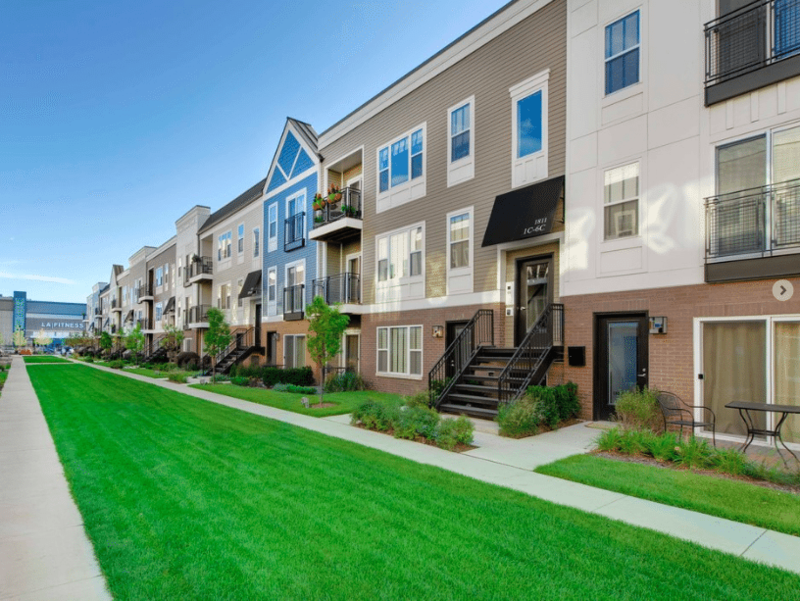 Located in the hot West Loop neighborhood, Madison Aberdeen Place takes its prime bustling location to another level. Each two-bedroom penthouse is outfitted with a fully-furnished rooftop deck. These spaces are tastefully appointed in sleek, contemporary furnishings, including sofas, chairs and coffee tables. Renters at Madison Aberdeen can enjoy dinner or drinks with multiple guests, skipping long bar lines and crowded beaches further to the east. Luxury Living Chicago exclusively handles leasing for the building’s one-, two- and three-bedroom units, priced between $1,800 and $3,900 per month. Apartments range between 800 and 1,375 square feet. Rent includes one garage spot. 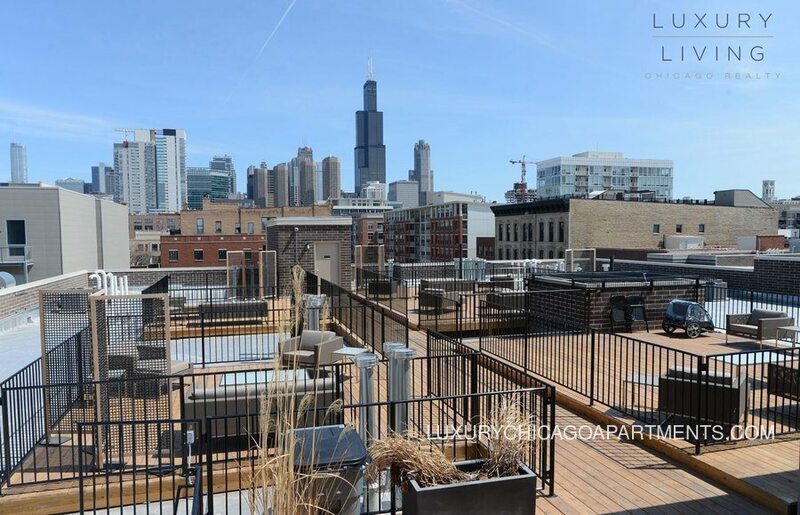 On the north side of the city, Ravenswood Terrace offers 150 luxury apartments for rent, with a communal rooftop terrace and private outdoor spaces. First floor apartments come with 8-by-8 patios, offering renters with families or roommates significantly more space to entertain and live. The patios increase total unit space by 24 square feet compared to the higher-level balcony apartments. What’s more, patios connect with a one-acre landscaped courtyard for easy access to walk the dogs, play games or simply stretch your legs. Ravenswood Terrace includes studio, one- and two-bedroom units between 538 and 1,212 square feet. Apartments are priced between $1,650 and $1,775 per month.